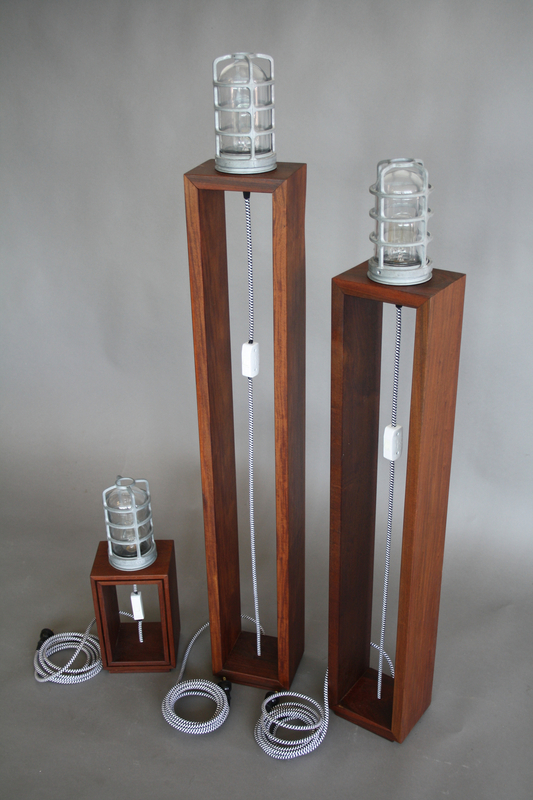 Inspired by lamps in a Scottish cottage, these lamps feature cloth covered cord and are available in African Mahogany, Ash and Walnut. Shown in walnut, these simple nesting tables use pieces of off-cuts to make simple but functional pieces. The "place series" offers clients a chance to mark an heirloom piece of furniture or wall hanging with a "place" of their choice - cottage lake, neighbourhood, river system etc. The "place" is carved using a CNC machine, then painted and filled with epoxy. This "place" was marked on a maple slab, and added to a steel coffee table base. Mahogany coffee table with shelf. 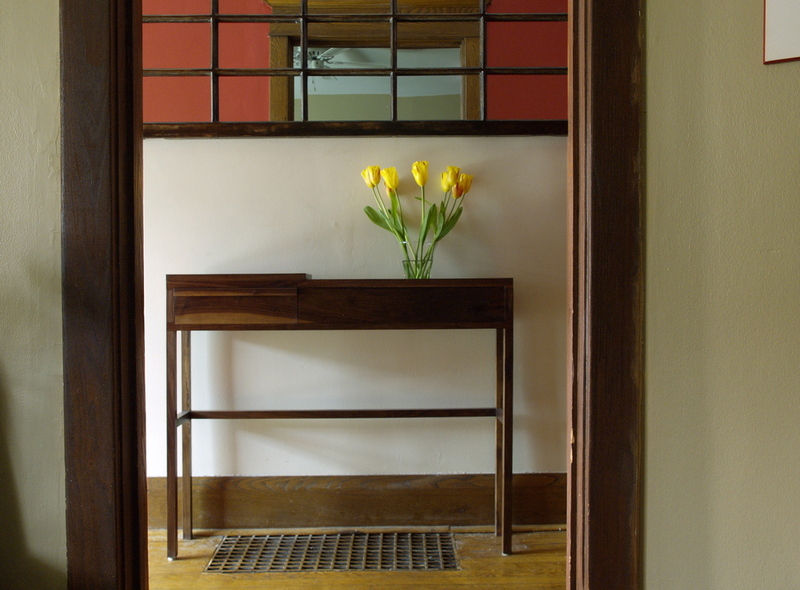 A slim, functional hall table for narrow entrances. Shown in walnut. 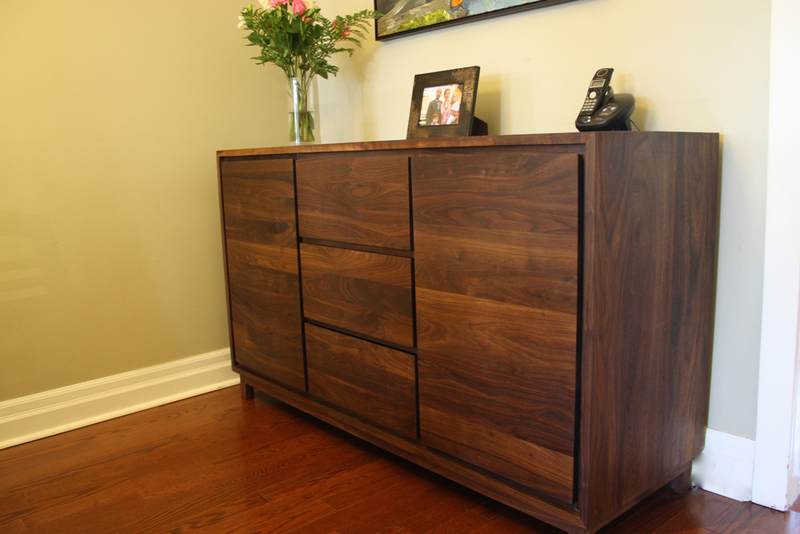 Both traditional and modern joinery are used in this walnut set. Shown in walnut, built to match the dining table, but often used on its own. This 9' custom desk was topped with century old reclaimed barn board and included a kennel for Tucker the dog. Built-in cabinets for a basement rec. room house games, books and a flat screen TV. The kid's desk is also a fun and functional spot. 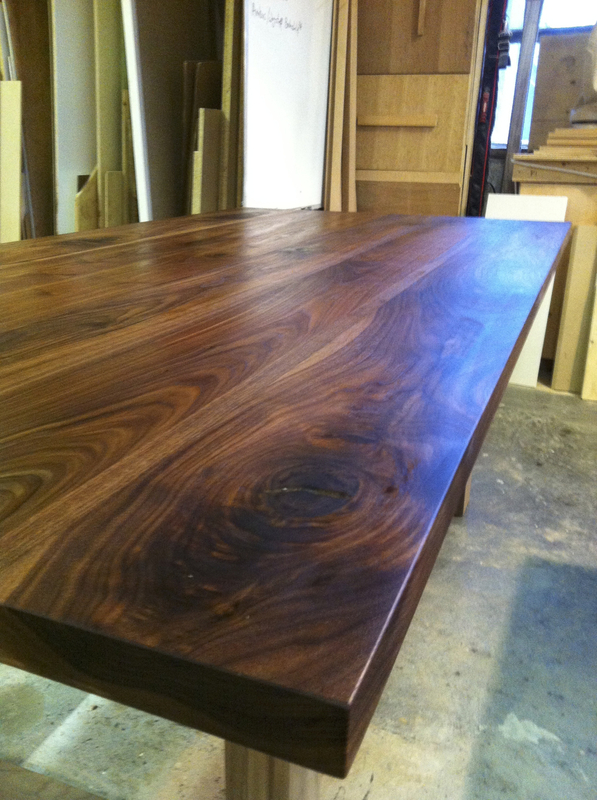 7' x 3.5', and shown in walnut, this table uses "U" shaped legs to maximize the number of comfortable table settings. 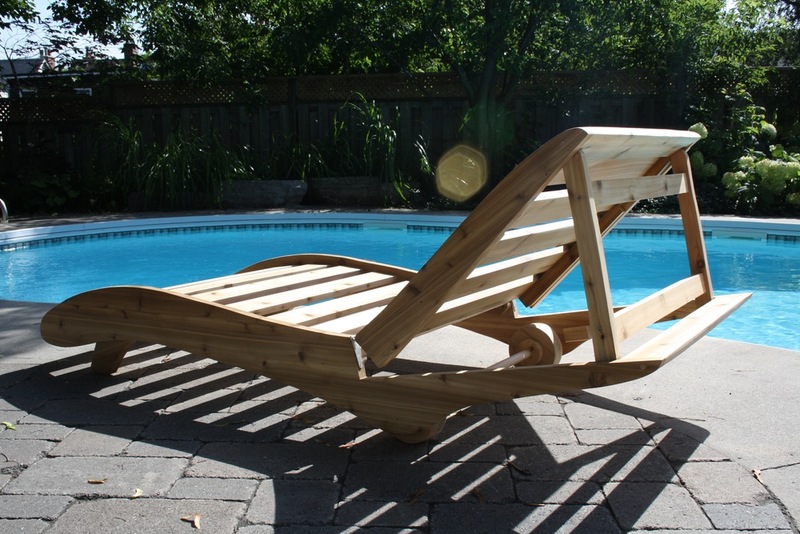 Shown in cedar, the hollywood chaise lounge was inspired by a 1953 "easy-build" template. 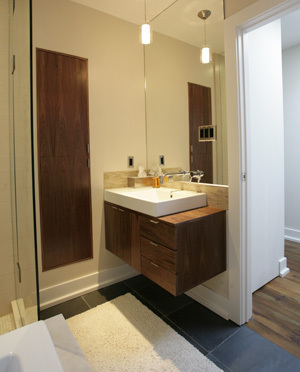 This custom vanity was built with pine and reclaimed elm flooring, using a traditional dry sink as inspiration. 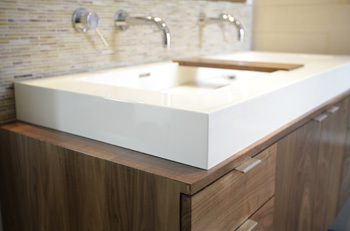 A floating walnut cabinet with drawers and doors is a great home to this extra wide double sink. 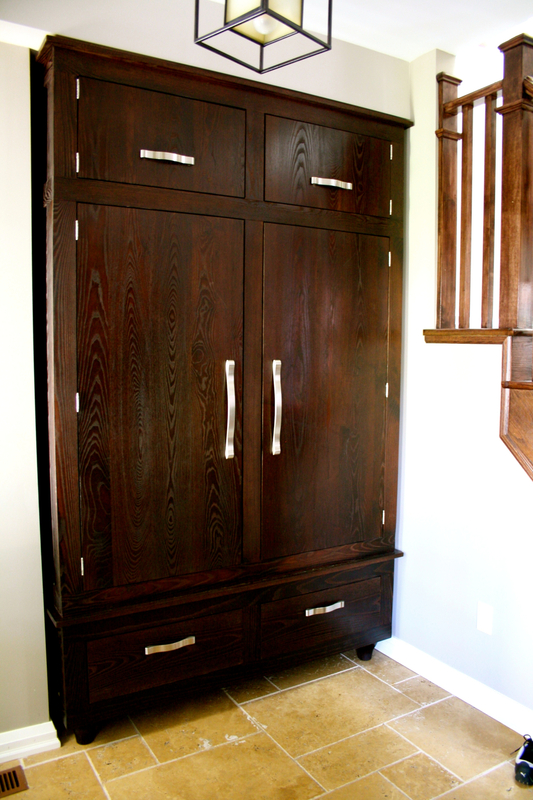 A floating walnut cabinet with drawers and doors has a matching, tall medicine cabinet to keep it company. A walnut, wedge shaped built-in adds functional space and a focal point to this room divider. A pass-through and glass shelves compliment the walnut built-in. An addition to this kitchen, the cabinet uses chalk board doors to leave messages and hide school bags and shoes at the back door. An entrance wardrobe in ash, with a mahogany dye and steel hardware. 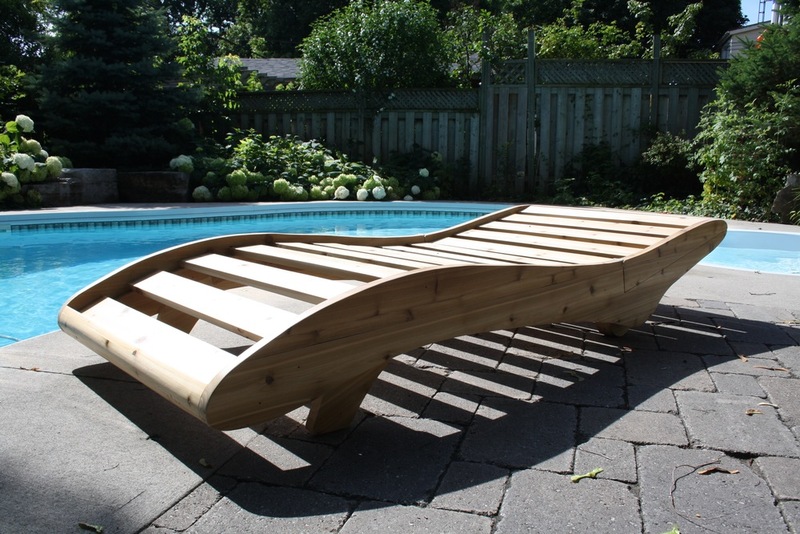 Not for the back seat, this cedar and jatoba bench was custom built for an equestrian centre north of Toronto. Built for the main entrance of Artscape's newest facitilty, Youngplace, random pieces of re-purposed lumber were used to create this unique planter. Painted poplar built-ins for a Toronto living room. Custom 3rd floor built-in helps organize this closet behind sliding doors. Made with mostly reclaimed plywood from an office desk system, these bunks add much needed shelving storage to a bedroom. 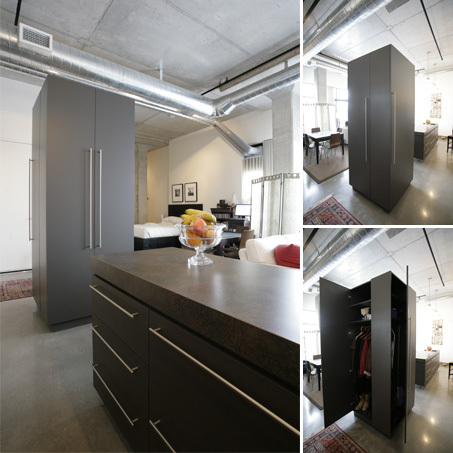 A multifunctional free-standing unit for a downtown loft lacking storage space. Matching the "monolith", this kitchen island creates much needed storage and counter space to a loft kitchen. 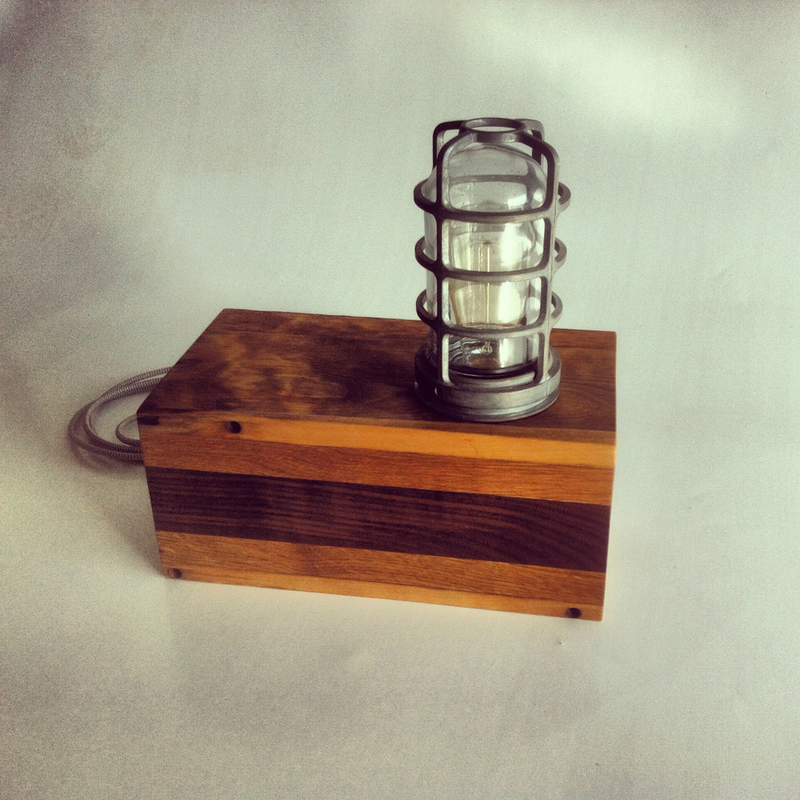 Walnut and ash off-cuts were paired with a reclaimed factory explosion proof lamp & an edison bulb. 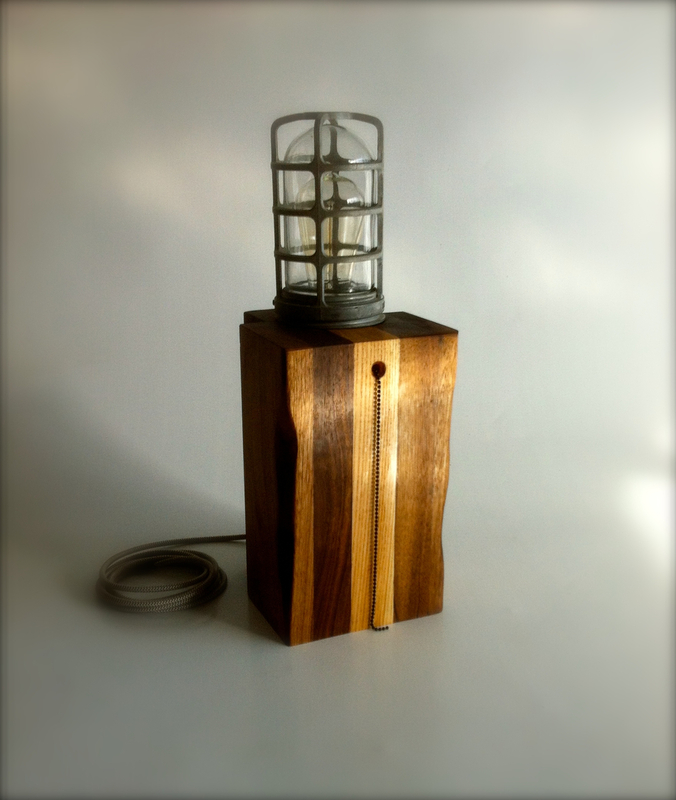 Reclaimed walnut and maple from a century kitchen table were paired with the factory lamp. Reclaimed oak paneling that was found behind a layer of drywall was used to create this king sized headboard. A solid walnut single "cafe" style motorcycle seat. A solid walnut sideboard with a bank of three, deep storage drawers and two doors hiding adjustable shelves. All are opened via the chamfers, forgoing pulls or knobs. Found factory lamp fixtures and pau ferro cut-offs frame the hounds tooth cloth covered cord and in-line switches on these table, or floor lamps. One set in sapele, another in quarter sawn white oak. Kitchen island/table with storage made from salvaged urban Siberian elm. 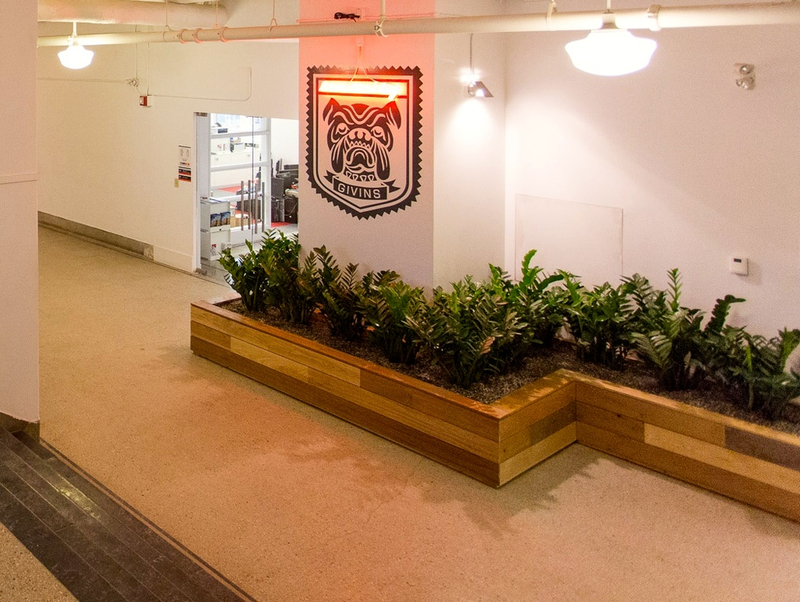 A Toronto home needed storage for a family of five. 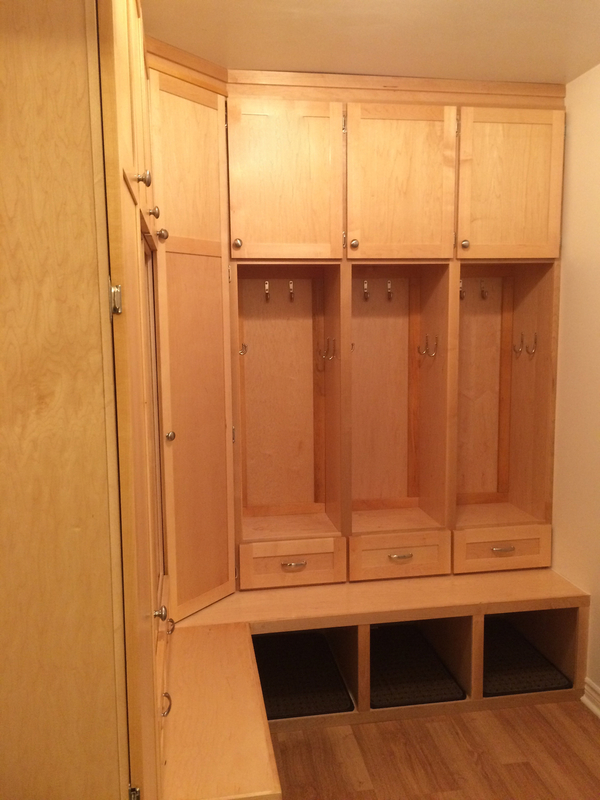 Off of the kitchen, this maple built-in created lots of usable space. A Toronto semi had a blank wall, which was warmed with a gas fireplace and this set of bookshelves. 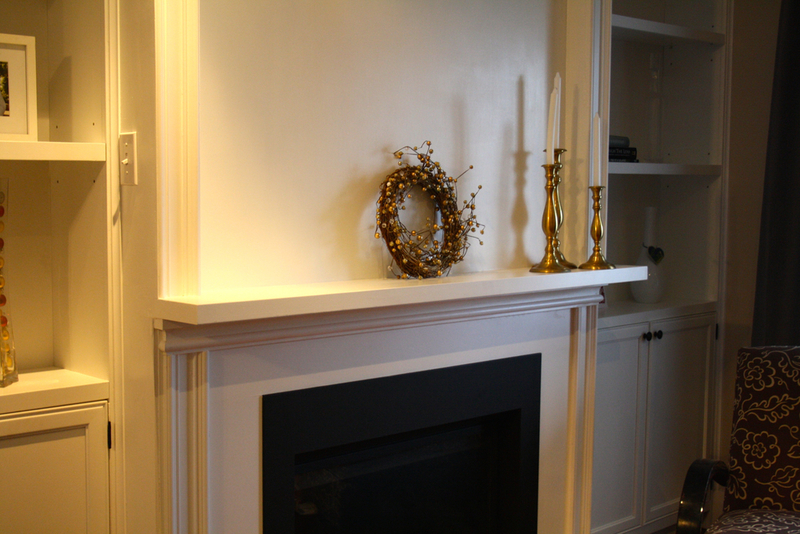 A new gas fireplace was added to the living room of an 1890's home in Toronto. The mantle and bookcases were built to give it some company.